The Design Specification document establishes how we organize and present that information in the User Interface. It is often the common point of reference for sign-off by stakeholders – and provides guidelines and continuity throughout the process. The trick is to create a document that is comprehensive, informative and readable. Push active design to the forefront. Most decision makers see the “vision thing” of what we’re creating as a dance of screens, not as an abstracted Visio diagram (just watch their eyes glaze over). The sooner the design is turned into clickable HTML Wireframe, the better. I generally try to “annotate” my HTML prototypes with funcspec info, so that the model is itself a living document, but a good ole paper document has its advantages. The “Design Specification” (I’ve also heard it referred to as a Conceptual Design doc, UI Spec, Interface Design, etc.) is the high-level overview that provides context and common ground for everyone on the team. Stylistically, it’s the “illustrated novel” or “manga” version of The Vision: It offers screenshots, lotsa visuals, the essential functional points, and a lean Cliff-notes summary of the story. Just the sort of thing that attention-deficient stakeholders might be willing to scan for a couple of minutes. Combine it with a shallow-working HTML model, and you might actually convince them. Stylistically, it’s the “illustrated novel” or “manga” version of The Vision: It offers screenshots, lotsa visuals, the essential functional points, and a lean Cliff-notes summary of the story. Just the sort of thing that attention-deficient stakeholders might be willing to scan for a couple of minutes. Combine it with a shallow-working HTML model, and you might actually convince them. Disclaimer: I’ve been a Tech Writer and Documentation Manager. I believe that documentation is underappreciated within the process, often poorly executed (esp. in terms of “nobody wants to wade through it”), and absolutely critical to our success. As the “designated communicators” in the development environment, it’s ultimately our responsibility to advocate it. I often try to be a “liaison” among the various team cultures – collecting, interpreting, translating, and serving info up as appropriately as I can. Identify (at a high level) who can do what . We have to know who we’re talking about and how they work. This is particularly critical to our ability to design a “customer-centric” product. Identify (at a high level) “what you need to be able to do” . a practical description of what tasks you need to accomplish in the business requirements. Identify underlying “givens”, s.a. the relationship to existing software. Identify any technical risks associated with the development of new capabilities. The trick is to create a document that someone actually wants to read. This set of descriptions are taken from a complex business case at Bunge Global Markets. The Overview captures the basic business goals and functional outline concisely. The Workflow is a high-level visual “snapshot” of the Tasks. 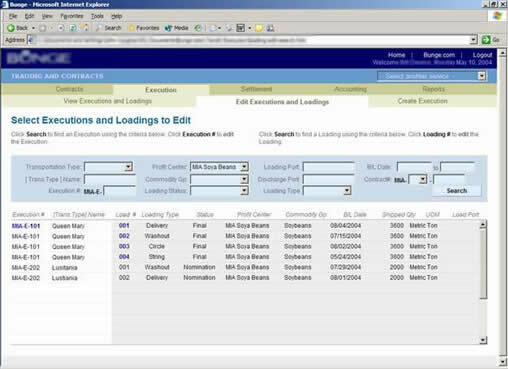 You can create or edit Executions and add Purchase Contracts and Sales Contracts to their affiliated Loadings. Every Execution consists of one or more Loadings. Every Loading consists of one or more Purchase Contracts and one or more Sales Contracts. The Execution Staff can view, create and edit Execution records and their affiliated Loadings. They can Settle Loadings. They cannot manage Overfills and Underfills. Traders and Trade Admins can view Executions and Loadings. They cannot Settle Loadings. They can manage Overfills and Underfills. Accountants can view Executions and Loadings. They cannot Settle Loadings. They cannot manage Overfills and Underfills. We know which Actors have Permission to perform a Task. Tasks are generally identified in Business Case and Business Requirements documents. Every primary Function is captured as a Use Case (“UC”) , which is described in a separate document. Execution Staff can create and edit (Traders, Trade Admins and Accountants have View-Only permission). Clickable items in the Search Results table go to either Edit or View pages, depending on your permissioning. The screenshot provides a visual reality check for style, layout, understandability, appropriateness and conformance to presentation standards. The sooner it’s HTML, the better. Every Functional (i.e. clickable) Item is identified by Type and described by Action. We identify the appropriate, underlying Business Rule (“BR”) and describe it in a separate document. What are the boundaries of a Functional Specification? Seems to differ from team to team. Often it’s a huge, unwieldy all-of-the-above doc that’s hard to create, maneuver or manage. As such, it’s inappropriate for a small-team Agile environment. Plus – nobody wants to read it. And, even tho it *should* exist before work begins, of course it never does. What are the boundaries of a Functional Specification? Seems to differ from team to team. Often it’s a huge, unwieldy all-of-the-above doc that’s hard to create, maneuver or manage. As such, it’s inappropriate for a small-team Agile environment. Plus – nobody wants to read it. And, even tho the document should exist before work begins. Of course, it never does. Is that teams hate to produce docs, or read them – and usually can’t manage ’em – I’d try keep the document types to a tightly targeted minimum. There’s rarely a Documentation resource (person) assigned to the team. How many team members know, or care, about producing useful documentation? Terminology can be a problem: I recently observed to a client that most of their documents (aside from being inconsistent in terms of content, terminology, and style), invariably used the terms “functional” or “design” in the title. Hence rendering the terms meaningless – and providing no clue whatsoever as to what the docs contained. Net/Net: Documentation is the manifestation of Process. It’s a skillset in its own right – the sort of thing that UX should advocate. After all, docs are useful only to the extent that they are usable.